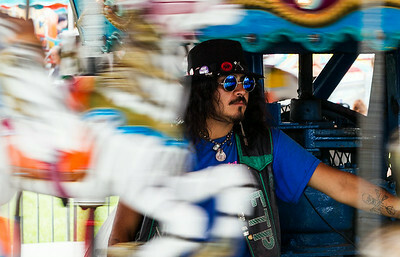 Kyle Grillot - kgrillot@shawmedia.com A Great American Shows employee who describes himself only as 'Ryder' operates the carousel during Fiesta Days Saturday at Peterson Park in McHenry. The festival runs through July 20th, and offers live music, rides, games, a car show, arts and crafts, children's events, food and fireworks. Admission is $5 at the gate, 10 and under are free. 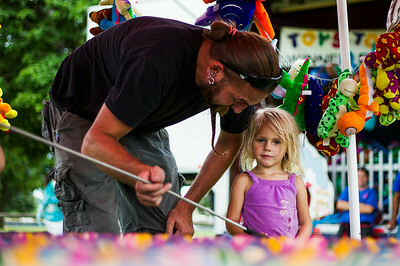 Kyle Grillot - kgrillot@shawmedia.com Jason Doody of Lakemoor (left) watches as his daughter Molly Anne, 3, fishes for a prize during Fiesta Days Saturday at Peterson Park in McHenry. The festival runs through July 20th, and offers live music, rides, games, a car show, arts and crafts, children's events, food and fireworks. Admission is $5 at the gate, 10 and under are free. 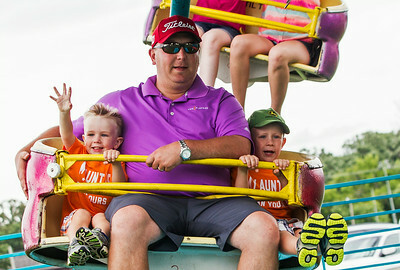 Kyle Grillot - kgrillot@shawmedia.com Andy McEnaney of McHenry (center) rides a ride with his sons Connor, 3, (left) and Collin, 5, during Fiesta Days Saturday at Peterson Park in McHenry. The festival runs through July 20th, and offers live music, rides, games, a car show, arts and crafts, children's events, food and fireworks. Admission is $5 at the gate, 10 and under are free. 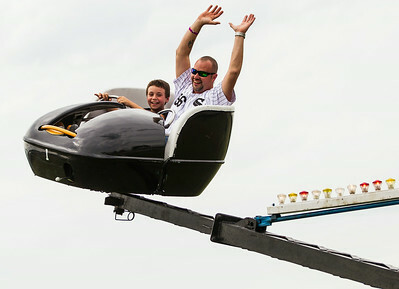 Kyle Grillot - kgrillot@shawmedia.com William Bock, 8, (left) rides the Spider ride with his dad, Billy Bock, during Fiesta Days Saturday at Peterson Park in McHenry. The festival runs through July 20th, and offers live music, rides, games, a car show, arts and crafts, children's events, food and fireworks. Admission is $5 at the gate, 10 and under are free. 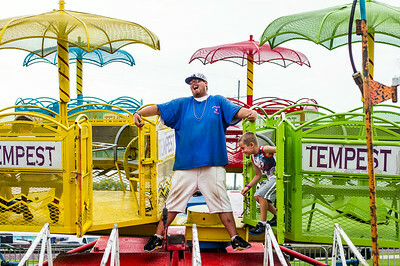 Kyle Grillot - kgrillot@shawmedia.com Chris Texas of Madisonville, Ky., (center) laughs as Timmy Moravec, 7, of McHenry changes location on the Tempest ride during Fiesta Days Saturday at Peterson Park in McHenry. The festival runs through July 20th, and offers live music, rides, games, a car show, arts and crafts, children's events, food and fireworks. Admission is $5 at the gate, 10 and under are free. 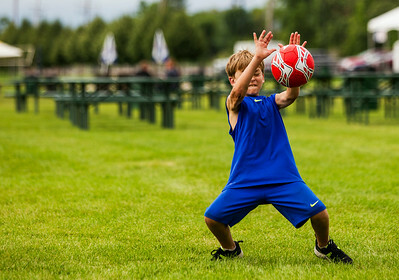 Kyle Grillot - kgrillot@shawmedia.com Andrew Wallace, 10, of Johnsburg, blocks a soccer ball while playing with a friend during Fiesta Days Saturday at Peterson Park in McHenry. The festival runs through July 20th, and offers live music, rides, games, a car show, arts and crafts, children's events, food and fireworks. Admission is $5 at the gate, 10 and under are free. 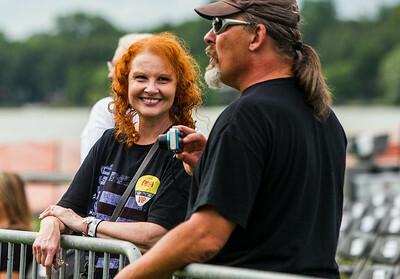 Kyle Grillot - kgrillot@shawmedia.com Karyn Bergen, and Steve Richards, both of Rochester, Minn., listen to Tom Kiefer perform a sound check during Fiesta Days Saturday at Peterson Park in McHenry. The festival runs through July 20th, and offers live music, rides, games, a car show, arts and crafts, children's events, food and fireworks. Admission is $5 at the gate, 10 and under are free.